I was writing in my apartment, not really minding my TV, when a news headline made my heart stop. For a moment, I thought it was a joke. But as a recent ex-banker, I knew it wasn’t, because I had seen it happen every day. The top three banks in the U.S. made more than one billion in overdraft fees in the first quarter of 2015. What?! One billion dollars? That’s crazy. I once saw a definition of calories that made me laugh: tiny creatures that live in your closet and sew your clothes a little bit tighter every night. Bank charges are similar, only they make the holes in your wallet a little bit larger every night. The awesome part about bank fees, though, is you can choose not to pay them. I haven’t paid a single bank fee in years, and I don’t intend to. Here’s how I avoid each of these standard fees, with average costs based on my experience with several major banks. A bounced check fee is the most common, yet most avoidable, extra charge. A shortage of even one cent in your checking account when you write a check means you’ll get hit with this fee. A bounced check fee goes both ways, so the payer and the payee both get charged — and the payee often passes that charge back to you. For example, if you paid your electric bill and your payment bounces, the electric company will charge you as well. Generally, your bank won’t call you before the check bounces or while the check is bouncing to let you know — you’ll just see the charge the next time you look at your account. When you set up a checking account, apply for overdraft protection. Some banks, like Bank of America and Chase, simply connect your savings account or credit card to your checking account. Other banks use a separate line of credit attached to your checking account. This service automatically transfers money into your checking account if there isn’t enough to cover a check, withdrawal or purchase, at no charge. This prevents your check from bouncing and saves you late fees, embarrassment and a whole lot of trouble. If your bank uses a line of credit, you’ll pay some interest, which is often just a few cents or dollars depending on how much money you used and how long it took you to pay back. This is another fee that goes both ways: The sender is charged an outgoing wire transfer fee, while the receiver pays an incoming wire transfer fee. Unless you’re wiring funds internationally because the receiver’s bank is based outside the country, you don’t need to wire transfer anything. By now, almost all banks offer bill payment services. Get the person or company’s information, add them to your payee list, and let the bank send the money for free. If timing is a strong factor, schedule the payment early. Most bill payment systems only take one or two business days. Another alternative is to go to a branch of the other party’s bank and deposit a check yourself. Some banks will transfer funds from your savings account to your checking account to cover transactions larger than the amount in your checking account. So if you try to use your debit card to spend $50 but only have $40 in your checking account, your bank will move your money for you — for a fee. While it costs less than a bounced check fee, an overdraft transfer fee is still an unnecessary cost. Check your account daily online or on your smartphone and transfer your money yourself. To make it easier, set up alerts for when your checking account balance drops below a certain minimum. Don’t use an out-of-network ATM for anything, even to check your balance, or you’ll likely face fees both from that ATM and from your bank. Know where to find your bank’s ATMs. For example, Long Islanders can use Citibank’s ATMs in all 7-Eleven stores, while Bank of America customers will find ATMs at every Long Island Railroad (LIRR) station. If you’re not sure, most banking apps offer an ATM locator. If your bank doesn’t have a nearby ATM, take advantage of cash back transactions. Go into a store and make a small purchase. If you buy a $2 pack of gum, you can ask for $40 cash back and they’ll charge $42 to your debit card. Also, some banks refund the non-network ATM fees to compensate for their lack of locations or to make life easier for customers. Check whether your bank offers this service. Bank accounts can come with all sorts of extra fees — monthly maintenance charges, costs to order a checkbook, fees for bank checks and money orders, and stop check fees. Become a preferred member of your bank, which usually means it will waive these types of fees. All banks have tiered banking, although the details differ. Set up an appointment with a bank representative to discuss your options. When I worked at a commercial bank, we had different levels of membership with the highest one offering free personal checks and official checks, as well as exclusive tickets to games, Broadway shows and many other benefits. Most banks use your minimum combined balance, including debt like mortgages or even credit cards, to categorize you as a preferred member. For instance, because I have a mortgage, I don’t pay for bank checks, money orders, checkbooks and all the fees listed above. Why? Because the bank already makes money off me from the interest on my mortgage. The beauty of this is, I could have only $50 in my checking account, need an official check for $49 and get charged nothing — with just a dollar in my account. Stop letting bank fees tear holes in your budget. Signing up for direct deposit can help you waive some fees, depending on your bank. Ask your bank representative about your options. Check your accounts online daily to make sure you’re not close to overdrawing or bouncing a check. If you use mobile banking, it can take less than a minute. 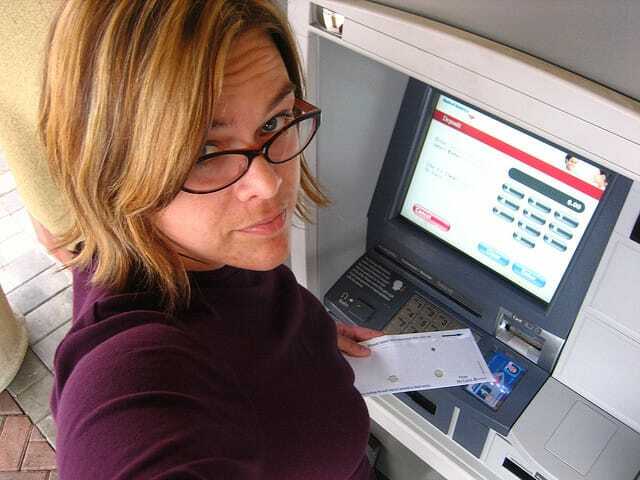 Your Turn: How do you avoid bank fees? Share your tips in the comments! Ogechi Igbokwe is the founder of OneSavvyDollar, which makes your financial life dramatically simpler, more convenient, more productive, less risky, more fun and fashionable. An ex-retail banker, she writes about entrepreneurship and personal finance; specifically budgeting and saving, credit building/rehabilitation, mortgages, career and education.